Whenever anyone asked my Papa Joey how old he was, he swiftly corrected them and said “I’m eighty-seven years young.” Or “ninety-three years young.” Or a hundred and one years young. He roller-skated up into his eighties, celebrated his second and third Bar Mitzvahs at the ages of 83 and 96 respectively, and twirled me around the dance floor of his assisted living facility just six weeks before he passed away. I believe the youthful mindset my great-grandfather maintained throughout his life was a major force fueling his longevity as well as the fullness of his one hundred and one years on earth. The willingness to learn new things is a key factor in staying young. For older generations, it is so important to understand the new technology that is available today that they never had growing up. Our society relies on cell phones, computers, GPS, video chat, just to name a few. There are a plethora of innovative ways for older people to call and receive emergency care, check out e-books from the library, travel to new places and speak to long distance grandchildren face to face. If they are willing to put in the time and sometimes money towards understanding the new media. I work in the fitness industry, an area filled with emerging exercise modalities and nutrition trends. To maintain my personal trainer certification, I am required to take continuing education credits annually to ensure that I am in tune with a wide range of currently accepted fitness tools. Were this not the case, we might all still be doing Jazzercise! A few years ago, a client approached me about doing CrossFit because her boyfriend was doing it. I disregarded it as something I didn’t think she needed and might be dangerous for her. Last year, I took a CrossFit certification course and learned that the practice of “CrossFit” is actually rooted in taking fundamental functional movements and breaking them down so they are accessible to literally everyone. A power clean (an Olympic lift) can be done by the most beginner athlete using a weighted medicine ball. A handstand pushup can be regressed into something more like a “down dog” pushup from yoga. By spending a little bit of time and money, and removing the barriers in my mind, I opened up myself and my clients to a whole new world of movement and conditioning opportunities. This year, it was my greatest pride to offer that same client a chance to perform a workout from the CrossFit Open (an annual worldwide competition) that she was able to do without any regressions. As for me, I turned 34 a few days ago. In the weeks leading up to my thirty-fourth birthday, I competed in a pole dance fitness competition for the very first time. I achieved a personal record of an Olympic lift that I only began working on six months ago. I nailed a high level standing acrobatics pose with my boyfriend that looks like something out of a cheerleading movie. None of these skills were accessible to me a year ago, and they were even further out of reach in my twenties. Jennifer, age 33, competing in pole fitness for the first time at the Arnold Sports Festival. 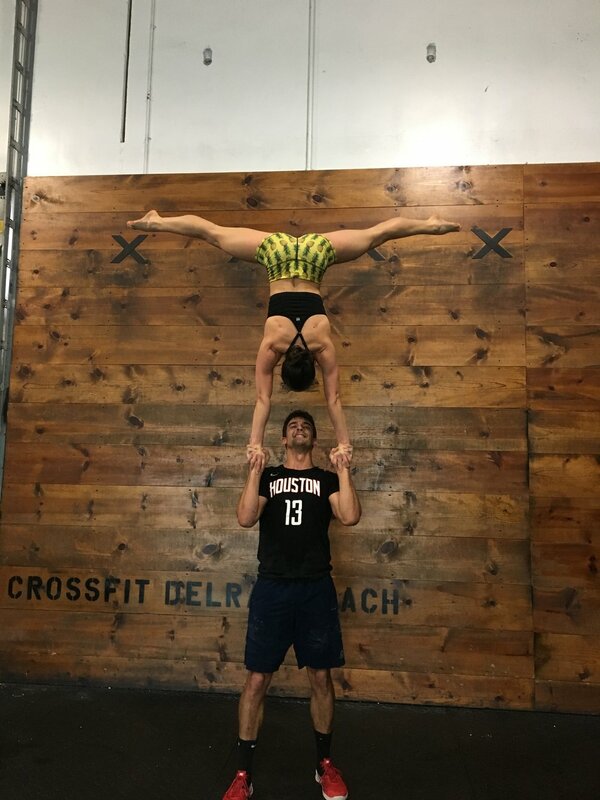 Jennifer and her boyfriend doing a standing acrobatics move called “hand to hand” after finishing a CrossFit workout during a recent vacation to Delray Beach. I have a client Roberta who turned 63 recently. In the two plus years we have been training, she has done her first pull-up, handstand, deadlifted her own body weight and held herself up on the gymnastics rings for a record time of thirty seconds. She has broken past fear barriers to jump onto a twenty-inch box and she even attended an acroyoga class, allowing another person to lift her up in the air. She started training with me because she said the classes at Equinox she had always attended were getting too fast-paced for her. By acknowledging her own needs, she was able to carve out a path to develop her best self. Not only does she look toned and strong, she has also learned skills that challenge and excite her. If she walked into one of those Equinox classes today, they would probably think she was the instructor! Roberta showing off her first pullup at age 62! In our twenties, it’s harder to be introspective and break away from the group to do what’s best for us. As we age, we learn to seek out the experiences that coincide with our individual needs, wants and abilities. We lose the herd mentality of doing everything our high school friends did. We develop our own expertise professionally and recreationally, and we learn to seek out the knowledge of others who can make us better. I remember a time when I wanted every birthday to be my twenty-first and I proudly declared myself “Forever 21.” Now I find it far more satisfying to push my boundaries, both physical and mental, and when people ask what my age is, to watch their face for signs of amazement. Age is just a number. The metrics that really matter are how many times a day do you do something that challenges your mind? How often do you find yourself out of breath (because of an activity you chose, not just walking up the steps to your apartment)? How often do you say “today’s the day I’m going to face this fear?” And how many people do you keep around you who live life that same way. The more those personal hurdles, milestones and conquests add up, the younger you’ll be on the inside, and that’s the number that really counts. Jennifer Margulis is the founder of Small But Mighty Training, a personal training company in midtown Manhattan. She has clients ranging in age from 20’s to 70’s and specializes in accommodating their individual goals, bodies and abilities. If you are interested in getting your body to look younger, feel younger or function better, you can contact her at smallbutmightytraining@gmail.com. Follow Jennifer on instagram @croptop for more weightlifting, acrobatics and pole fitness footage!